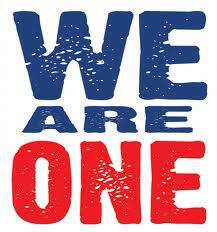 Weingarten rights guarantee an employee the right to Union representation during an investigatory interview. These rights, established by the Supreme Court, in 1975 in the case of J. Weingarten Inc,, must be claimed by the employee. The supervisor has no obligation to inform an employee that s/he is entitled to Union representation. 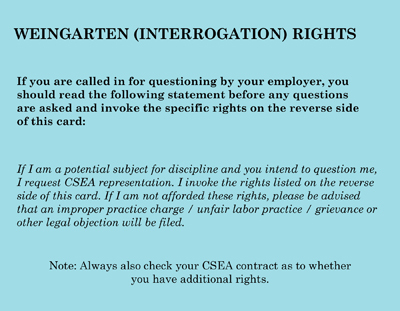 If you are called in for questioning by your employer, you should read the following statement before any questions are asked and invoke the following specific rights. 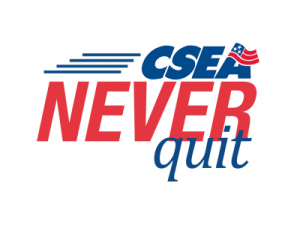 For me and my CSEA representative to be informed of the subject matter of the questioning before the questioning begins. To confer with my CSEA representative before the questioning begins and at any time thereafter. 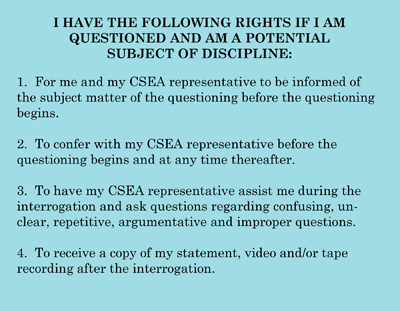 To have my CSEA representative assist me during the interrogation and ask questions regarding confusing, unclear, repetitive, argumentative and improper questions. To receive a copy of my statement, video and/or tape recording after the interrogation.